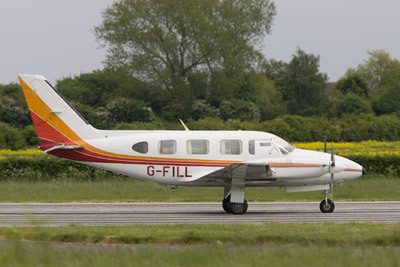 Cranfield is a civilian airfield that used to be an RAF station. 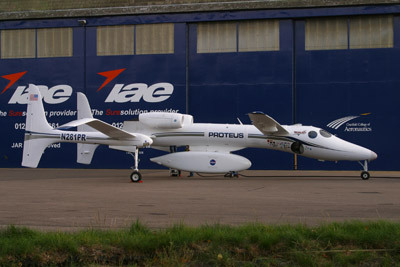 Once home to the famous College of Aeronautics, the technical site is now the campus of Cranfield University which incorporates the College of Aeronautics; some of the hangars are in use with the University which has on charge several aircraft of its own. 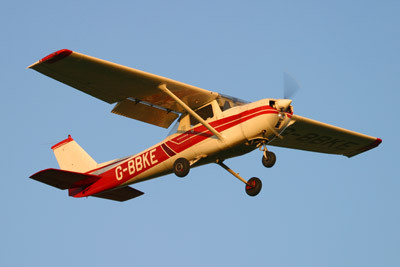 The airfield is home to a number of flying schools. It is located between Milton Keynes and Bedford, on the edge of Bedfordshire around 4 miles North of junction 13 of the M1. 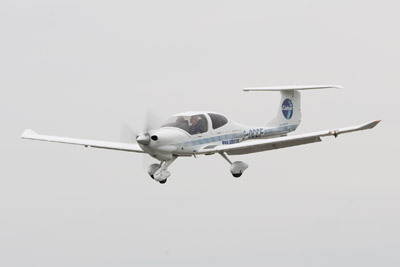 Light aircraft galore - Cranfield is home to several aviation training facilities. There are some ex-military attractions here, but fewer than before since Kennet Aviation's move to North Weald some years ago. 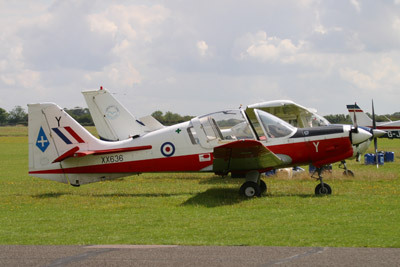 General day-to-day activity can include the occasional ex-military aircraft; mostly lighter prop jobs like Chipmunks or Bulldogs. 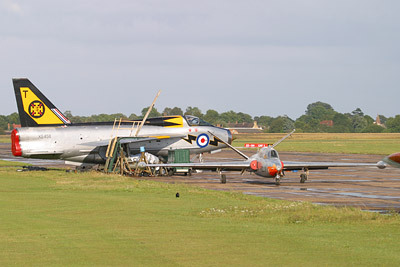 Of primary interest to this site's visitors, though, is the preserved Lightning which is in taxiable condition; it carries out a number of fast taxi runs (with reheat when at all possible) throughout the year. 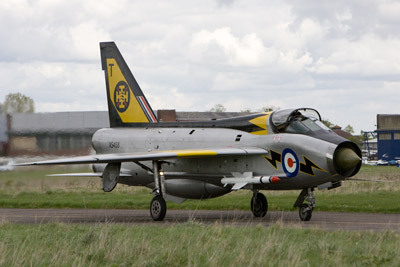 The owner makes a limited number of places available for people to view activity up close - see the Lightning XS458 website for dates and contact details. 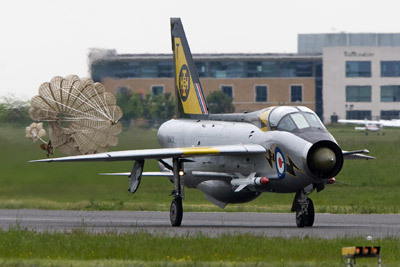 On these occasions the Lightning is normally taxied twice, once before lunch and once after, with a static reheat run on returning to the parking area - well worth handing over some of the folding stuff to get to enjoy that up close! Flying activity is highest during weekdays and office hours, with very little happening in the evening. Weekends are quieter in winter and when the weather isn't great, but when the sun is shining it can be very busy. Assuming you're coming from Cranfield village having come off the A421 by the Happy Eater and Burger King, proceed West through the village. Just follow the road and you'll come to a pub called The Carpenter's Arms on the right, with the village sign on the green on your left. There's a lane running down past the pub (Merchant Lane) - go down here. This lane leads to crash gate 2 (A). You'll be able to se a HS.125 on the dump, though it's the other side of the runway from you and too far for a good photo. The sun is behind you for most of the day so this is a pretty good spot for photos, however you're not very close to the runway. Aircraft departing from 22 are obscured until they're airborne. Helicopters sometimes practice just West of the crash gate, but the sun makes photos of that difficult in the afternoon. Departures from the paved 04 are often only just airborne as they pass here but you really need more than a 300mm lens for decent photos. Anything using grass 04 (very rare) is even further away. Back down the lane and turn right at the pub and proceed West out of the village. The next useful spot you'll find is a layby on the right side of the road (B). This is crash gate 3 and gives some view across the airfield and may be useful for logging serials, though poor for photography due to the distance the aircraft are from you. Not a particularly good spot at all. Sometimes helicopters use this side of the airfield for training, and this point is about as close as you'll get to them. Continue on the road and very shortly there'll be a right turn which you should take. You'll see that this road curves up ahead; you want to come off the road on the right-hand side just before this curve. You'll often see cars parked on the grass here so it's not hard to see where to go! Don't park in front of crash gate 4 or in the entrance to this area; you can safely park on the grass and gravel to the right of the crash gate (C) (though you may get oil spots on your car from incontinent spam cans). There is a lane to the left of the crash gate which you can also park in, but somebody lives down the end so to make life easier for them try and park to the right of the crash gate if possible. When runway 04 is in use, some aircraft will taxi to just in front of the crash gate and hold, then continue onto the runway and depart away from you - lighter types often taxi onto 04 further up though, and won't go anywhere near this crash gate. Landing aircraft will come in from behind you, sometimes very low over the hedge (and the road!). When runway 22 is in use, departing aircraft line up almost out of sight and will often fly right over you; how low depends entirely on the pilot and type, but normally that's quite high. Arriving aircraft normally land out of sight and turn off the runway before getting close enough for a good photo. Helicopters tend to ignore the runway and fly over the trees to your left regardless of wind direction. 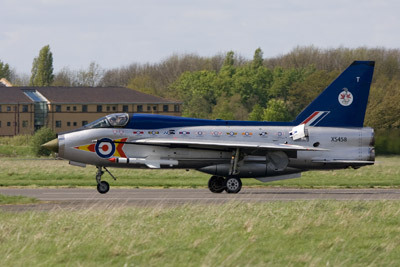 When the Lightning is doing taxi runs, the 04 end would appear to be the preferred end to begin the run - unless the wind is heavily favouring runway 22. She'll taxi past the crash gate at point C, line up and blast off down the runway without delay - you can of course vary your position and go further south-east along the hedge for different angles! Just don't stand directly behind her... voice of experience! If running from the 22 end, it is unusual nowadays that she comes all the way to this end, and usually turns off before here, too far away for decent photos. A walk down to the end of the lane (D) will give you a limited view of the aircraft parked on the disused runway 08/26; fine for serial logging, rarely good for photography. Even late in the day the sun shouldn't bother you too much. The Lightning is normally parked here but is covered by tarpaulins etc. except when it's being worked on or readied for a taxi run; however. The derelict Lansen that was in this area has departed for a new home. Leaving this spot, turn right to get back onto the road and keep going to the roundabout. Turn right here and then take the right-hand lane straight away, curving off to the right. You'll soon reach another roundabout, turn right and you can park in the Innovation Centre's car park (E) which is fine out of office hours (assuming the entrance isn't closed) but may be difficult during the day as the car park fills up quickly. Walk to the next roundabout and from the top of it and the earth bank along the roadside (F) you can get a good view of the aircraft parked on the disused runway. Just don't trample any plants or spotters may become unpopular with the University. Photography is best done during the middle part of the day, in the morning and late evening the sun will prove annoying. Crash gate 5 is on this roundabout - do NOT park here. Back to your car and drive past the Innovation Centre to the roundabout and turn left. Keep going and shortly you'll see a petrol station on the left with a mini roundabout ahead. You want to go straight ahead. Further up, on the right hand side of the road the first turning you'll see is into the University. During the day the traffic control here will usually not be in use so you can enter the campus easily; it can occasionally be active, if so, press the button and say you're going to the airfield, they should let you through. Keep left and follow the road around until you get to a junction. Turn right, then pick a car park - any car park! From here you can see one of the areas between the large hangars and can walk right up to the edge of the airfield with only a tiny grass bank between you and the aircraft (G). You can continue to explore within the University areas on foot; do it in your car and you will probably attract campus security's attention. Views of aircraft on this side of the field are fairly limited but you can get very close to those that are between the hangars. Just don't stray onto the airfield itself or into any hangars. Continuing further towards the airfield itself, drive towards the large hangar that has 'SPORTS HALL' painted on its doors and turn left after it. You'll go past a large red brick building. Just past it on the right there are a load of parking spaces - park somewhere here, avoiding reserved and named spots please! From here you can explore further on foot, e.g. towards the control tower; you can walk up to the edge of the tower (H) for a view of the area in front of the hangars; might be worth popping into the tower to ask if you can have a wander round airside - you never know! Just bring a high-vis vest if you intend doing that. To the south of you here you'll see some portakabins, one of which is Bonus Aviation's. You can walk between them to a fenced area in front of the Cafe Pacific (I). If there are no parking spaces available elsewhere you can actually drive down to this area and park here - aim for the tower but turn right before then. As for the cafe - decent food, big servings and reasonable prices - and a bar and toilets too! From the front of the cafe you have clear views of aircraft parked nearby; the fence is nice and low so no problem for photos. 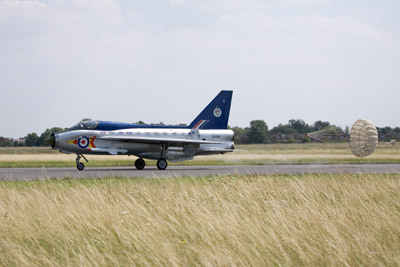 You may get some aircraft taxiing past to get to runway 04 - the Lightning doesn't usually take this route though, coming or going! Back to the car again and go out the way you came in (you could turn left instead of right back towards the sports hall - if so, another left turn brings you down to point J which may permit viewing some aircraft not quite visible from the cafe frontage. However, let's continue out - take the one-way road to the exit (and the entrance! ), keeping left. Turn right onto the road again and just after the 'national speed limit' sign you'll see a track off to the right. This is a public right of way - go down here and you'll come to crash gate 1 (K); there's room to park in the field at the end of the lane on the left (don't block the field entrance, the lane or the gate). From the crash gate you have a clear view of the HS.125 on the dump, plus fairly decent views of movements on runway 22/04. When 22 is in use, aircraft will taxi past the dump within easy reach of a 70-210mm class lens, but the sun is in your face except in the morning. Aircraft departing from 22 are out of sight until they lift off, but you have a good few seconds in which to get a clear shot of them in the air. For aircraft landing, this spot isn't very good because they're out of sight and then partially obscured by the lie of the land on their roll-out. A walk back down the lane will get you distant views of aircraft parked by the hangars, and better views of anything departing from runway 36 (which rarely happens). From here you can follow the public footpath along the field edge to the north for clearer views of aircraft on the taxiway/runway; nobody seems to mind if you stray off the path a bit and aim towards the hedge near windsock pole - just do not go any further east than what's left of the hedge line (you should also see a small grass bank and line of wooden posts marking the edge of the airfield). If there wasn't room to park here, you can go back to the main road, turn right and watch out for the second small entrance on the right (point L) - there's room for a few cars to park on the concrete on the left hand side of the road here. Now the footpath used to come out here, but appears to have been diverted further north, further along the road. A quick investigation found it to be blocked by overgrown foliage, so the easiest thing to do is go round the metal gate here (the rickety wooden bit next to it is easy enough to go through) then walk up to the white gate and climb over that - you're now on the public footpath route. You can now follow the footpath south along the hedge past the old air raid shelter (mind the nettles!) back towards point K, or north-east towards the northern corner of the airfield. If you choose north-east, it's obvious enough where the path route is, aim for the hedge line that extends outwards from the small brick building and aerial on the airfield. Again nobody seems ot mind if you go towards the edge of the airfield (e.g. point M) - this is nice and close to the taxiway so it's superb for aircraft taxiing onto runway 22, or anything finishing its landing roll on 04 (though most of the smaller types will have turned off back by the dump). The shot of the Lightning here is actually taken from on the airfield (with permission, as a guest at the taxi run - you can do this too! ), but the view from further back is not too much different - just a longer lens needed. If you stick to the path though, you'll come to the hedge line and a stile that gets you through to a field that is normally full of sheep. If you have a dog with you - on a lead please! You won't be in this field for long, turn right and strike out to the east, along the hedge line and towards another hedge and another stile (point N). Now once over that you are on the airfield so please take note of the warning signs. There are good views of the taxiway and runway here, good for landing shots later in the day; taxiing shots not so good because of the length of the grass most of the time. The footpath continues to your left, within the airfield boundary, please stick to it and do not try to get closer to the runway. For a 'sunny side' view of landing aircraft in the earlier part of the day (up til about mid afternoon), you can continue across the approach (be sensible, and don't hang around here, and look out for landing traffic before crossing as pilots are human too and do come in too low by mistake sometimes! ), towards point O. I've not hung around here to test the airfield staff's patience with people loitering on the footpath - though I have seen local kids doing just that, without any apparent fuss. Keep following the path, and you'll come to point P, a stile enabling you to exit the airfield and continue on the path towards Cranfield village. However once off the airfield's land nobody is ever going to mind you hanging around taking photos, and this is a good spot to do that from. Good for side-on take-off and landing shots here, though past about mid-afternoon in the summer the light starts to shift to the other side of the runway. A 300mm lens is about right for most light aircraft types here. 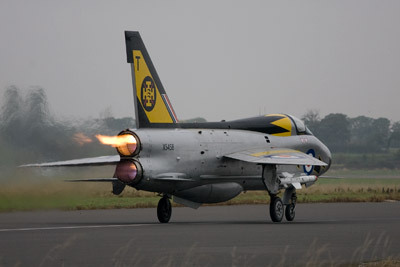 If the Lightning is running on runway 22, this is a superb place for a bit of noise and a good reheat picture. If you just want to get to this spot, incidentally, the quickest way would be to come from the Cranfield village direction - the other end of this path can be found on the High Street, it's about 55 meters south-west of Pounds Close (on the opposite side of the road) - looks to be to the left of 3 terraced houses, and to the right of a larger house that is set further back from the road. You may also feel more secure leaving your car in the High Street than leaving it parked on the other side of the airfield. That's about it for Cranfield. If you go back to the car and continue on the road to the north, a minute's drive or so will get you to a junction. Turn right here and you're now on the road running back to Cranfield village, which goes by the end of runway 22. The hedge and distance makes views onto the runway very poor, and the only places to park are in the three field entrances to be found on the right hand side of the road after the approach lights. Some people do park on the edge of the road (e.g. point Q) but this is very dangerous - lots of drivers come along this road at high speed and coming round a corner to be faced with a speeding idiot on one side of the road and a spotting idiot on the other is not a pleasant experience. For photography the sun is against you in the morning and most pilots are still quite high as they cross the road. You cannot save yourself a bit of walking by cutting across the field here to get to the airfield - all the gates are securely closed to keep the sheep in, and there is a hedge/fence at the airfield boundary too. University security are active in the evenings and on weekends and it's possible they may frown upon you taking your car into the campus area (I've never had any problems with them); on foot you shouldn't have too many problems. During the day there are so many people going in and out of the various car parks I think security just give it up as a bad job and no doubt concentrate on watching specific areas for dodgy characters. The airfield side of things at the edge of the campus is normally not a problem to wander round in, and relies on big fines to deter idiots from going airside without permission. The cafe is well worth a visit! There is a petrol station and convenience store within the campus area; petrol price is high compared to that in Milton Keynes or Bedford though. There are also a few petrol stations, various shops and a Budgens supermarket in Cranfield village. Duxford is not much more than an hour's drive away to the South-East - the quickest route is to take the A421 across to Cardington, come off onto the A603 to Sandy, onto the A1 Southbound, off onto the A507 at junction 10 (just before the A1 becomes the A1(M)) towards Baldock, hang a right in Baldock onto the A505 to Royston and just stay on the A505 round Royston and on to Duxford.